When Lisa and partner Alex first viewed their house, it had been converted into bedsits and was in a ‘horrible’ state. Luckily, they could see its potential and put in an offer straight away. Read on to find out how they did it, then browse through more amazing real home transformations and extensions. The original kitchen, which was located at the centre of the ground floor, posed a major challenge. ‘It felt cut off from the rest of the house with no links to the garden,’ adds Lisa. The couple contacted five local building companies, including design and build specialists Plus Rooms, who had been recommended to them. The plans were tweaked and redrawn, and the neighbours served with party wall notices, as the new extension would be built right up to the plot boundary. No planning permission was required as the size of the extension fell within permitted development rights. ‘The garden isn’t that big, so we didn’t want to extend out to the rear, and we could see that filling in the side return would create enough space for a large kitchen-diner,’ adds Lisa. Before work began, a mini kitchen was installed in the couple’s lounge, with a sink, washing machine and fridge, so they could carry on living in the house during the build. ‘Plus Rooms thought of everything, including temporary cat flaps,’ says Lisa. Structural steelwork was then installed and internal walls demolished, with the bricks retained to be reused for some of the new external cavity walls. A wall between the new dining area and one of the neighbouring houses was painstakingly stripped back and exposed for an industrial feel. The builders removed most of the old plaster then Lisa and Alex spent hours chiselling and hand-sanding the bricks themselves, which have since been sealed. Reclaimed flooring, salvaged from a convent, was laid by a local specialist as the original floorboards and some of the supporting joists were rotten and could not be saved. ‘We received beautiful samples of the flooring to choose from, and then around a ton of filthy blocks arrived, covered in tar, which took five days for us to clean and lay,’ laughs Lisa. 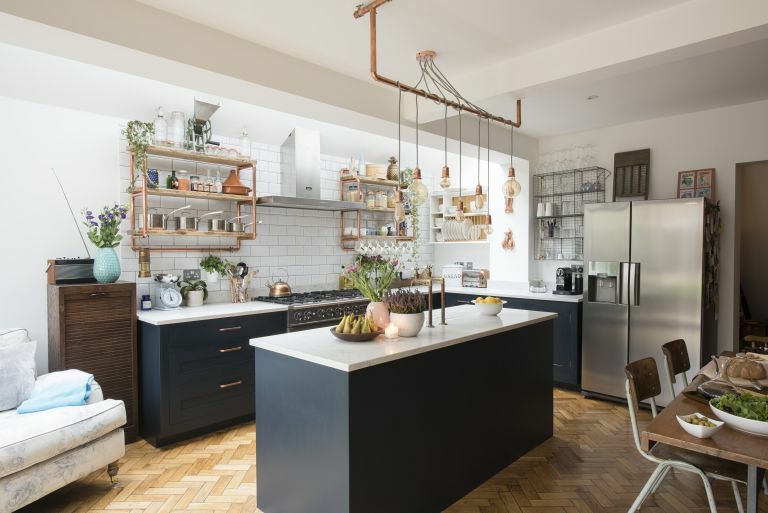 The simple wooden kitchen came primed ready for painting, and after trying a number of tester pots, Alex and Lisa chose Little Greene’s Basalt – an inky blue shade. Kitchen company Harvey Jones installed and painted the cabinets, and another company then cut and fitted the hard-wearing quartz worktops. After that, the Plus Rooms finishing team came back and completed all the decorating and tiling to finish the space. Alex and Lisa took charge of designing the kitchen's interior, searching for ideas online and compiling Pinterest boards. They found a local craftsman who made the open shelving, handles for the kitchen doors and part of the stunning bespoke light above the long island unit. Overall, though, the project has been a resounding success, and the couple now enjoy entertaining family and friends in their stylish new kitchen.